I am a "no homework" teacher. Extensive research - and my personal experience - discovered that homework for elementary school students doesn't necessarily increase learning. 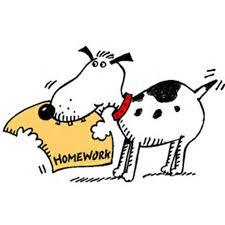 In fact, homework is often the cause of contention at home. It's just the opposite for middle, junior high, and high school. Homework shows a dramatic benefit in academic learning. Math: Watch a short video (or two) to prepare for the next day's Math lesson. Parents are encouraged to watch the short videos with their children to know what's happening in Math in our classroom. No daily Math homework page will come home. However, students who are not becoming proficient in daily concepts will have special homework sent home to help him/her master the missed concept(s) by watching the videos again and practicing related problems. Science: Usually there will be no homework. Study for tests as needed. Any assignment not completed at school automatically becomes homework.